It seems every year bike manufacturers are increasing power, decreasing weight and doing everything they can to be number one—the fastest, the most powerful etc—on paper anyway. The accessibility of 100+hp machines (from as little as £6,000) means more and more riders, often of questionable skill and experience, are getting on these potentially lethal missiles. Many of these bikes are equipped with a range of electronics to at least provide the appearance of mitigating the obvious safety implications of these machines and hopefully save a few lives along the way. As expected, the numbers alone don't tell the whole story. Bikes with an upright seating position—standards and dual sports—are often statistically considered the 'safest' but the demographic (what types of people buy a type of bike) and psychological (what persona/image do people adopt when riding a type of bike) reasons for this are outside the scope of this article. Ironically these 'safer' classes of bikes are quicker than they appear as evidenced by the three videos below. 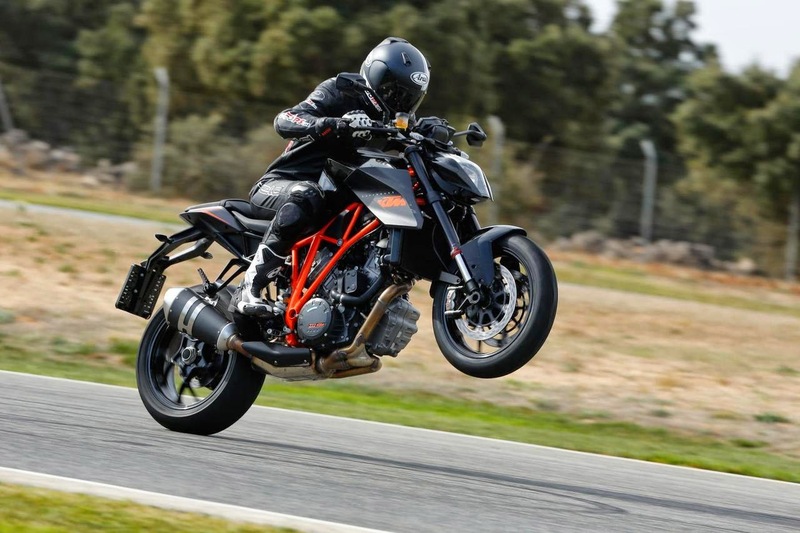 The videos above compare an enormous, heavy dual sport (one of the largest and tallest bikes available, and in no way a sports bike) to KTM's most powerful naked sports bike and also to KTM's 300/400 class sports bike. What is interesting is that the heaviest, least sporty bike is the fastest by 25% to 100kph, and the 'beginner' bike is only 0.5–1.5s behind the all-out sports bike. The tests were conducted by the same Austrian magazine for consistency. Considering the mix of bike classes and also regulations on real roads, 0–200kph is irrelevant in this context where obviously the high powered sports bike will kill the others. There comes a point where more power doesn't equal more acceleration because it simply lifts the front of the bike requiring the rider to either pull back on the throttle to avoid flipping the bike, or the electronics intervene and cut the power. Rider skill comes into the mix as it takes a delicate hand to get the power balance just right on a high power bike whereas on a lower powered bike the rider can ham-fist the throttle fully open. Weight comes into the equation as well—the R1200GS Adventure above weighs 25kg more than my (non adventure) R1200GS and while these bikes will lift the front wheel at 120kph by sharply opening the throttle, they are heavy enough that you need to be deliberate about it. In contrast my gentle, lower powered F800GS (85hp/83Nm/208kg—0–100kph ~3.6s) can be ridden with both wheels remaining on the ground at full throttle in any gear - and as such covers ground on real roads nearly as quickly as the much more powerful 1200. From a standstill it has a slight advantage because the 1200's electronics will reduce the power on hard acceleration to keep the front wheel on the ground unless the ASC system is disabled by the rider. The 1200 has the advantage for effortless passing because it has so much torque it often isn't necessary to shift down a gear or two like on the 800. The extra power becomes useful in practical terms only at speeds in the 140+ kph range, where the power can be utilised without the bike's front end aiming up at the stars—such as on the unrestricted autobahn in Germany or on a racetrack. However, this is not a guarantee either, as the following video demonstrates—an old model R1200GS (110hp/120Nm/236kg—affectionately known by many as 'the pig') on the Nürburgring ridden by a skilled rider who knows the limits of his bike and passes a number of sports bikes on that lumbering beast.